Chicago is one of the most scenic cities in the U.S. It’s easy to see why. 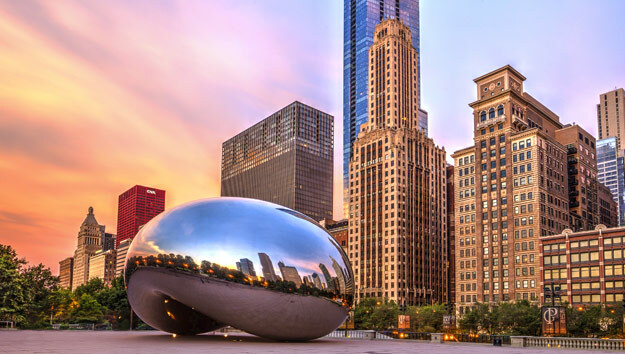 It’s a city of skyscrapers with forever vistas, a picturesque Lake Michigan shoreline, a river lined with architectural masterpieces, expansive lakefront parks with impressive outdoor art installations, and picturesque lakeside walking and biking trails. Chicago has two awesome ways to see the city from over 1000 feet above ground. 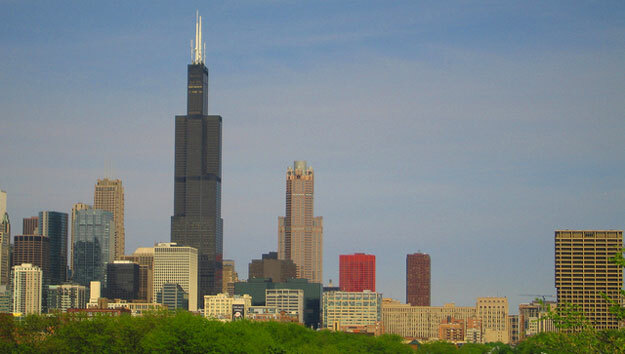 Its dueling skyscrapers, Willis Tower and Hancock Tower, have breathtaking panoramic views from large observation windows. Each also has gripping, over-the-top viewing options for thrill seekers. 360 Chicago -“The Tilt.” Take the fast, dedicated elevator up to the top of John Hancock Tower to 360 Chicago. Channel your inner Superman to climb into a glass and steel, hydraulically operated tipping platform 1000 feet up and hold on as it tilts out at a 30°angle over the edge for awesome downward-facing views. A tamer panoramic view option, one that offers food and wine, is from the Signature Room on the 96th floor. Or, take in the view over a drink in the Signature Lounge on the 96th floor. Skydeck Chicago -“The Ledge.” A warp-speed elevator ride up 103 floors in 90 seconds ends at the top of Willis Tower where views are fabulous and interactive exhibits are super interesting. Daring visitors queue up for their turn to step out on “The Ledge,” a glass box suspended 4.3 feet out over the edge for breathtaking views around and below! A favorite with kids and tourists, Navy Pier juts 1.3 miles out into Lake Michigan. It’s the place to spend a day enjoying a myriad of activities, watching the boats coming and going, taking a boat ride, having a bite to eat, sipping a beer, and shopping for souvenirs, surrounded by skyline and lake views. Views from the top of the Ferris wheel, 150 feet up, are awesome! Seadog Speedboat Lake & River Architectural Tour. Departing from Navy Pier, the bright yellow speedboat is a cool ride! The seasonal 75-minute boat tour roars along the Lake Michigan shoreline at thrilling speeds on the way to the Chicago River. It slows down to a leisurely speed as it navigates through the historic Chicago Locks and upriver. Along the way through bridges all the way to Willis Tower, Chicago’s architecturally unique skyscrapers tower overhead. The ride back to Navy Pier ends with the exhilarating full-throttle lakefront speed run! Chicago Architecture Foundation River Cruise. A 90-minute seasonal narrated cruise along the Chicago River aboard First Lady Cruises luxury vessels is an architectural show. From the open top deck or the climate controlled lower deck, views of the grand riverfront skyscrapers are great. The close-up perspective brings architectural details into clear view, and having expert docent guides point them out is great, as is the information they provide about the controversies surrounding Chicago’s quest for architectural greatness. Choose from one of many daytime tours or the popular Twilight Tour for phenomenal views of the skyscraper-punctuated skyline bathed in soft light of the setting sun. Lake Cruises Aboard Elegant Cruising Vessels. 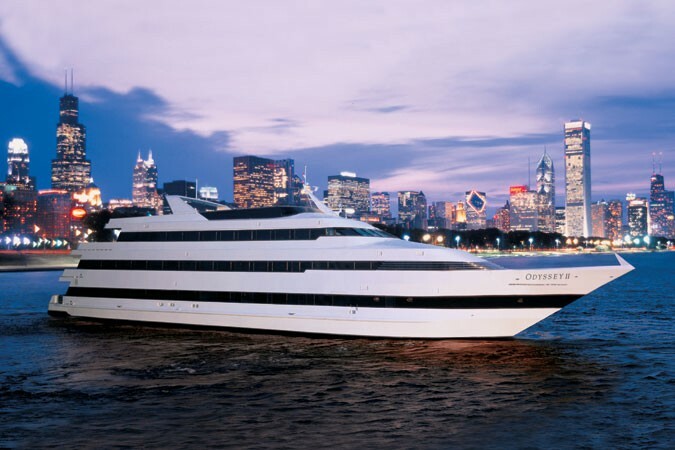 Enjoy it all – expansive menu selections, music and magical Chicago skyline views while cruising on Lake Michigan in elegant, climate-controlled comfort aboard large, beautifully appointed cruise vessels. Departing from Navy Pier, Odyssey Cruises and Spirit of Chicago Cruises each offers 2-hour lunch and 3-hour dinner options. They operate year-round on selected dates. Chicago’s skyscrapers and Lake Michigan lakefront views are only part of Chicago’s scenic beauty. Lovely, art-infused, people-friendly public parks are an added dimension to the city’s scenic appeal. Millennium Park. A favorite gathering spot in the heart of downtown, the expansive lakefront green space is carved out between the lake and skyscrapers. It’s alive with activities and concerts and is a remarkable outdoor gallery for Chicago’s public art collection. The reflection of the blue sky and skyline against the stainless steel elliptical Cloud Gate, aka the Bean is really cool. Crown Fountain, where the faces of Chicago citizens are reflected in two 50 foot Towers is lovely. In Boeing outdoor galleries, large modern and contemporary art pieces steal the show. Calm and beauty prevails in Lurie Gardens, a 5-acre sanctuary. Some of the best views of the Park are from the restaurant or Modern Wing of the Art Institute of Chicago, one of the finest and largest museums of art in the U.S.
Grant Park. Elegant Buckingham Fountain reigns supreme in Grant Park. One of the largest fountains in the world, on summer nights, the light show is spectacular. Chicago Lakefront Trail. 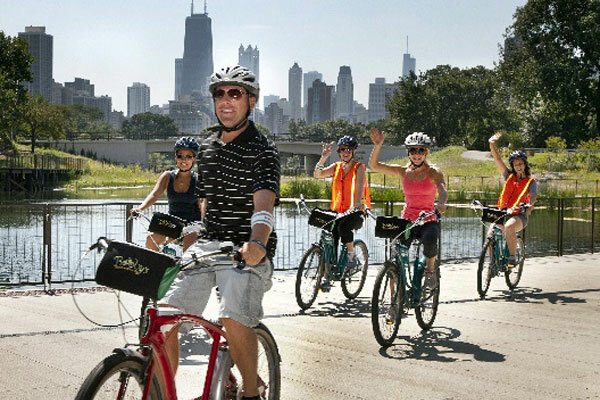 A walk, jog or bike ride along a scenic 18-mile dedicated paved pathway along Chicago’s North and South shorelines is a favorite. With the blue water of Lake Michigan on one side, lots of green space on the other, and Chicago’s skyline always in view, it’s super-scenic. On the lake side are harbors, boardwalks and beaches to explore. City-side is lined with playgrounds, gardens and iconic Lincoln Park, Soldier Field and Grant Park. Lakefront Neighborhood Bike Tour. A 7-mile easy bike ride on Bobby’s Bike Hike guided tour of Chicago’s North Side neighborhoods is invigorating and interesting. Mansions along the Gold Coast are stunning and riding past Lincoln Park Zoo, through Old Town Historic District, and along popular North side beaches and lovely Lake Michigan is fun. Sky chapel at Chicago Temple Building. The “Tallest Church in the World” is a true hidden gem. While it’s not about the views, it is scenic in its beauty and singular in its uniqueness. Located within the Loop, on Washington between Dearborn and Clark, the 21 floor building topped by a tall Gothic spire is the home of an active United Methodist Church which occupies floors 1-4. Sky Chapel is in the top spire, a ride up a small elevator plus a climb of 30 steps up to 400 feet above street level. Stained glass windows allowing lovely light into the small space and grand mahogany details create a serenely beautiful experience. Free tours are offered Monday – Saturday at 2pm. Milton Lee Olive Park. Often missed by visitors on their way to nearby Navy Pier, the quiet park on a point at 500 N. Lakeshore Drive offers one of the city’s most spectacular skyline views. The fountain-filled Memorial Park honoring Milton Lee Olive, a Medal of Honor recipient, leads to a pleasant walk along the lake. The sandy beach near the entrance is a fun find. The 606 aka Bloomingdale Trail. New to Chicago, the cool 2.7-mile elevated recreational path is located northwest of downtown and is accessible by car or public transportation. Built on an old elevated railroad line, it runs from east to west, connecting Wicker Park, Bucktown, Humbolt Park and Logan Square neighborhoods. The trail is flat and easy to walk, bike ride or roller skate. While there are only plantings, a few benches, and some art installations along the well-maintained trails, there are many places to get on and off the trail to snack and shop in residential neighborhoods. What it lacks in spectacular lakefront views, it makes up in views of interesting residential architecture, lofts and rooftop gardens. A popular place with locals, good signage helps visitors know the distance to the next exits and attractions at each exit.